Dunedin entertainer and clown Miguel will keep the crowds happy with his skills of juggling and all round clown entertainment. 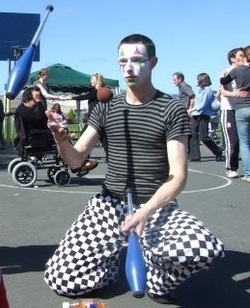 Miguel is a great kids entertainer, he will juggle, joke and even does balloon twisting. For the best in Kids entertainment in Dunedin contact us. Book now for Birthdays, events or even Christmas. The tallest man in Dunedin has arrived! Book Miguel for all your events and promotions...he sure STANDS out! Dunedin stiltwalker ready to go.